Download and test programs on target hardware. Capture and analyze trace information. Program the FLASH memory of many devices. Use JTAG or Serial Wire signals. Define unlimited breakpoints in RAM. Debug on multi-core devices based on Cortex-M microcontrollers. ULINKpro supports the CoreSight Technology. For ARM7 and ARM9 processor-based devices, two hardware breakpoints are supported in Flash memory. For Cortex-M processor-based devices, six hardware breakpoints are supported in Flash memory. Supported Core Clock Up to 200 MHz on Cortex-M processors (selected devices may have trace-port bandwidth limitations). Refer to Technical Specifications and Hardware Description for further characteristics. 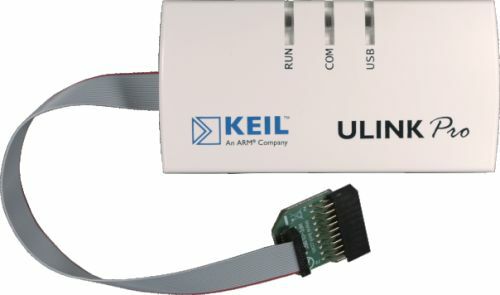 ULINKpro operates at 3.3V. All JTAG pins are 5V tolerant, which means that 5V can be applied to the inputs without damaging them and that 5V will be recognized as logic high. However, when ULINKpro generates a logic high, the voltage will take a value between 1.2V and 3.3V. For target devices that require the generation of 5V logic levels, add the ULINKpro 5V adapter to your ULINKpro in place of the 20-pin cable.